Rosmond Homes’ Shorehaven display home wears the latest black bathroom look. Bath: Noir 1700 Freestanding bath by Caroma. See the full Caroma range here. 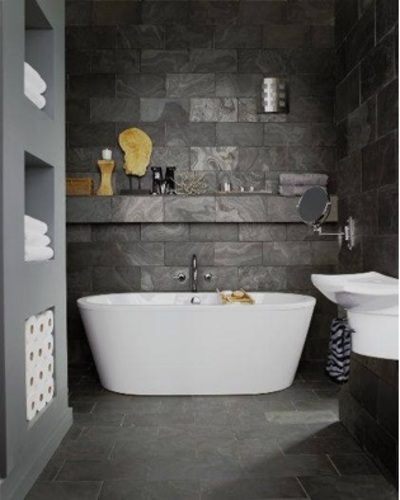 Today, every fashionista’s love of black has found its way into the most fashionable bathrooms. You could say black is the new black when it comes to finishes and fittings for your new home. Dark, moody palettes from blacks through to charcoals and mid-greys are adding high drama to the latest tiles, baths, tapware and vanity tops for new bathrooms. At Perth's Rosmond Custom Homes, we’ve responded to the trend by creating a range of dark palette bathroom options for the clients who build with us. One of the joys of building a custom home is being able to choose virtually any finishes and fittings you desire, and Rosmond’s dark palette will set your imagination alight. “Some clients might just want a splash of black to give that luxury feel or a heavier amount to offer the impression of a boutique hotel-style bathroom,” says Belinda Nicolaou, Rosmond Home’s Pre-Start Consultant. “More and more people are using a feature wall of black tiles or alternative upmarket cladding or even simply a statement black bath to add a touch of sophistication and elegance,” she says. “Black has proven to be timeless. It will be, and always has been, a classic look, which I don’t think will ever lose its appeal. 1.Charcoal tiles by Odin Ceramics – see more inspiring tiles and bathrooms by Odin Ceramics here. 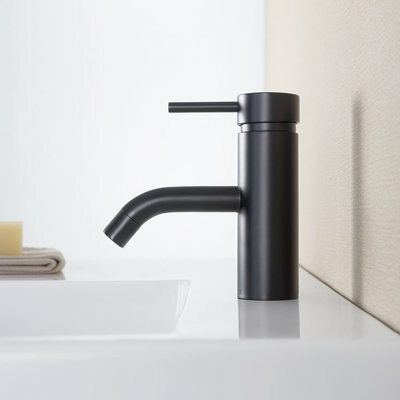 2.Caroma’s Liano Nexus basin mixer in black – see more inspiring tapware and bathrooms at Caroma here. 3. 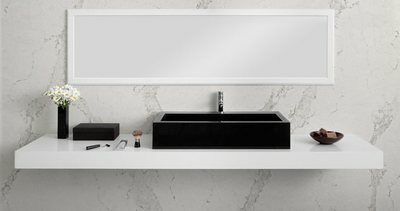 A stunning black basin, offset by a classic white vanity top – see more inspiring bathroom ideas on the Caesarstone blog here. As our name suggests, Rosmond Custom Homes provides a level of individual service and customisation that allows you to choose from the latest design trends to reflect your individual style – including black bathrooms. If you’re interested in building a luxury custom home, talk to us about your ideas now.